Having been back in London for over a month now, I’m still adjusting to various things. The heat on the tube, the grey skies, the commuting, and of course, the prices. But one thing that I have embraced again wholeheartedly is the food, the drink, and the abundance of new and exciting places. One of these is Skylight, which just opened last week and promises to be a destination for Londoners this summer. Unfortunately, I was unable to attend the launch myself, but my friend Rachel, a fellow Londoner whom I met on a crazy New Year’s Eve in Valparaiso, Chile, went in my place, and was kind of enough to contribute this review for The Swindian! You can follow her blog here – it has some great anecdotes about travel in South America, and makes me very nostalgic indeed. Last week, Kiran offered me the chance to head East into the unknown. 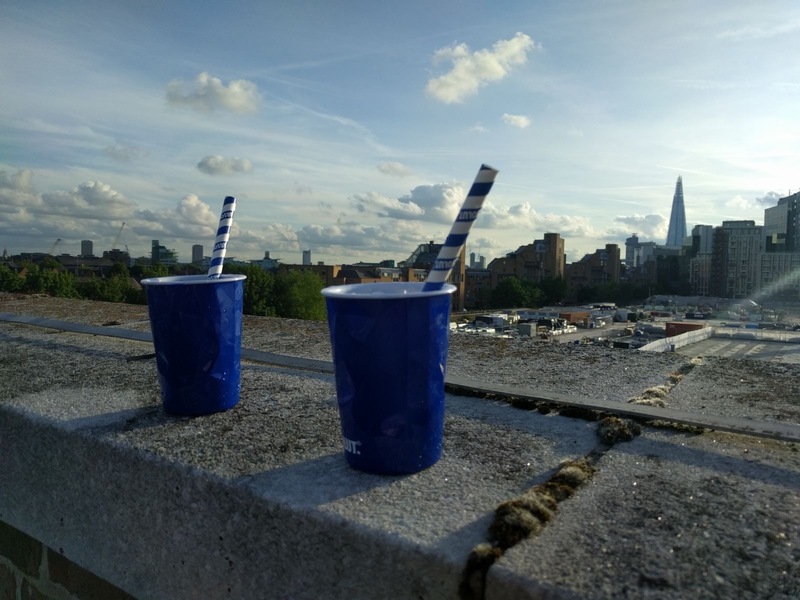 My friend and I braved the DLR to head to Skylight, a newly opened bar on the roof of a carpark in deepest darkest Wapping. It pitches itself as ‘British Urban Lawn Club’. Think acid-green astroturf as far as the eye can see, croquet lawns and petanque; garden furniture fresh from the pages of those catalogues that fall out of newspapers . My friend and I were lucky enough to go on one of the first genuinely stunning early summer days of the year – blue skies, warm air, a slightly giddy ‘this-is-all-too-perfect-when-will-it-rain?’ feeling. The set-up was promising. We settled in with a Swedish Summer cocktail – a refreshing mix of vodka, elderflower, soda water, cucumber and general summery vibes. We felt rather smug as we sipped it peering out across the sunlit sprawl. And then it comes to the food… which is kind of the reason that we turned up. We were promised street food from around the globe, the chance to sample a bit of everything. Our appetites were whetted and I left my friend guarding our picnic table whilst I nipped ‘downstairs’ to pick up a tastebud tinging array of delights. Except – and here is the really disappointing part of the night – there was none. We Serve Humans had run out of burgers before I even joined the queue at the night-is-young hour of half past seven. 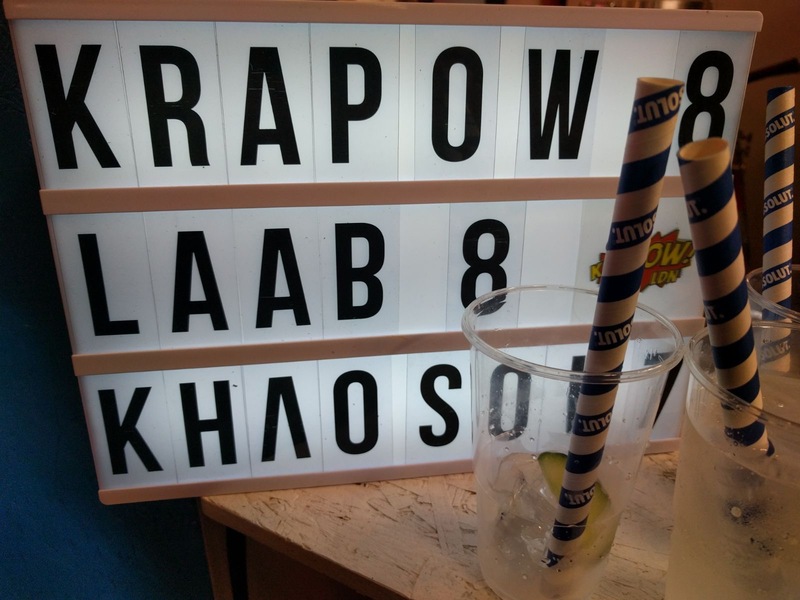 That left Yiro (Greek) who had ‘sold out of everything except halloumi fries’ and KraPOW (Thai). I made a snap decision and joined the sullen queue snaking its way back from KraPOW. And that is where I spent the next hour. After twenty minutes, my friend came and found me, a concerned furrow in her brow. For the next forty minutes we took it in turns to go back to the bar and fetch further glasses of the aforementioned summer cocktails. The other remained forlornly in the shambled assortment of hungry hipsters wasting away in their mom jeans. 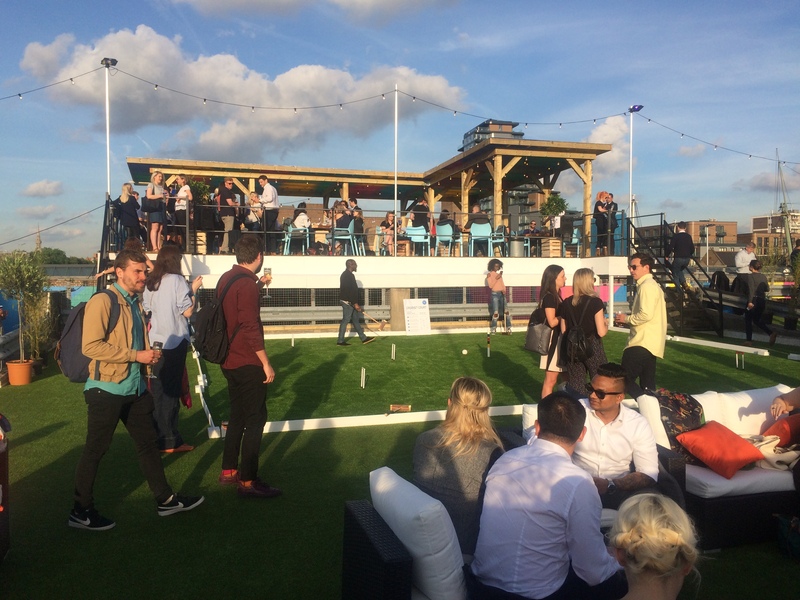 The majority of the venue is on the roof and benefits from views across London and (weather permitting) plenty of space to soak up summer rays. The food stalls are on the floor underneath which retains the feel of, well, a carpark. Rather than enjoying the views, we spent the majority of our evening in a dim concrete cage. By the time we got to the front, all of time had passed and we no longer knew our own names. 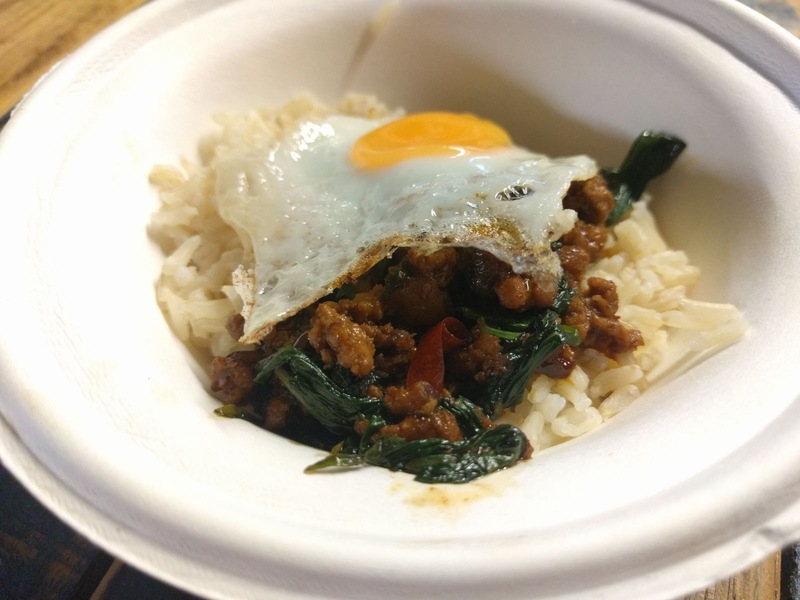 We were informed that they too had sold out of everything except for KraPOW’s Krapow: a thai street food dish featuring stir-fried pork mince served over jasmine rice and topped with a fried egg. My friend took the time to appreciate the tiny eggs that topped each of our dishes. I tucked straight in. They were delicious. Flavoursome and spicy and just what you need after several millennia drinking cocktails in a chilly queue. The three independent food pop-ups had clearly got it right. The food – for those who managed to get it – was a massive hit. They just needed more people serving more of it. In a venue for 600 people, all three were overwhelmed and underprepared. It seems like the carpark-roof-bar is fast becoming an embodiment of London stereotypes. It started (as the best things do) in South London with Frank’s. It was rustic and understated, didn’t promise too much and didn’t disappoint. Then West London got wise and opened its pristine Pergola on the Roof. East London went full on hipster with ironic lawn games and tiny fried eggs. What next North London? I won’t answer that because I fear Kiran is already considering not publishing this because ‘this is a food blog not a Daily Mail column’… or something. Also she lives in North London. If this review seems a little negative, it is because it is. I had hunger anger: hanger. I bear a hunger grudge: a hudge. I’m sure they’ll iron the kinks out – this was opening night after all. If you want to drink in the sunshine and plastic cupped prosecco in your local park won’t cut it, then go. Sunny views across London conquer all, especially when combined a refreshing vodka-based drink. Or seven. A word of advice: smuggle in a picnic.